It’s always a tricky task to make a game that’s challenging without being frustrating. It’s a fine line between making a game that puts up a stiff resistance while still being something that the player should want to come back to again and again. Thankfully, Flop Rocket (Free) manages to find this balance. This cave-flyer is very difficult, and tasks players with a very difficult objective to strive toward, but that’s part of the point: there’s an objective. Basically, your goal is to reach 5 kilometers in your spaceship, flying it to the end of the cave so that you can reach the glorious wastes of space. This is a very difficult proposition for two reasons, one of which is the giant spaceducks and worms in the way. 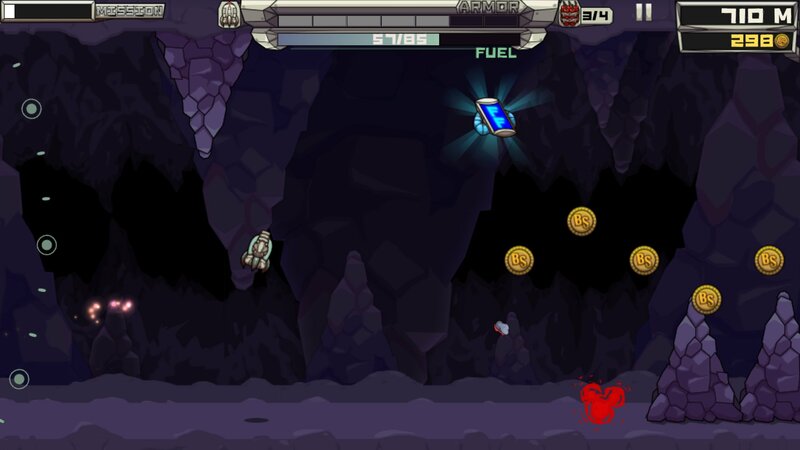 But they’re secondary to the fact that your ship is not that good, and it requires constant upgrading to give it more fuel, more armor, and better powerups in order to help get it to the end of that cave, with refuel pads getting further and further away. This is where the free-to-play aspect of the game comes in. Some games would make this about grinding for soft currency, while using hard currency as a gate to for boosts. And Flop Rocket does that, but the only payment it asks for is $2.99 for a ButterUp to unlock the full game, which includes 8 new upgrade paths, mostly for powerups, that will help you along. It also serves as a coin doubler, and if you sync it up with a BscotchID, it will carry progress across devices, and even unlock special things in other Butterscotch Shenanigans games. I think that this does a great job for the player (freemium unlocks rarely work well in terms of bringing revenue to the developer) in that you can play through a solid chunk of the game before deciding that you want the benefits of the ButterUp. Now, what about the hard currency in Flop Rocket? 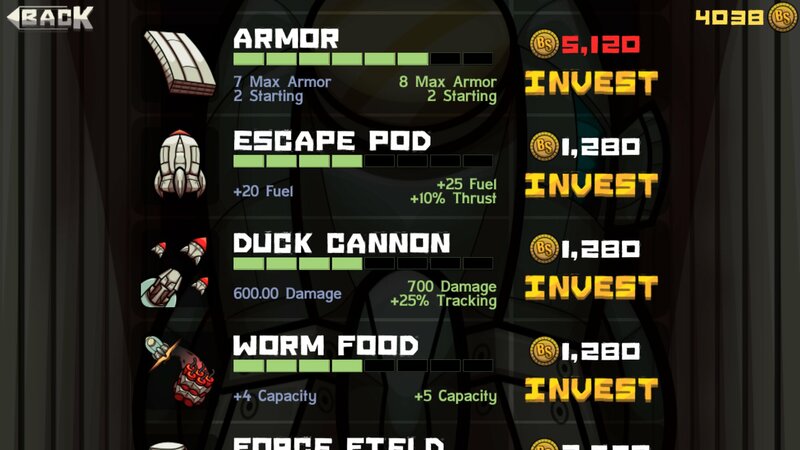 Well, it’s something you earn by completing objectives, and can be used to launch with more armor, an escape pod, a booster, and dynamite to kill the worms. But this currency, called juice, can also be bought for 150 coins each. This means that given the rate of coin earning, you’re going to have runs where you’re going to start with little-to-nothing just to grind for coins and to kind of challenge yourself, see how far you can get with just the base stats. But those runs where you deck out everything you have? Those are likely the ones where you have to go and hope you’re hitting the 5 KM mark. And the impressive thing is that the game still makes it really hard to achieve that objective. Even with loads of armor and fully-equipped powerups, they’ll excuse some mistakes, but you’re still going to have to play incredibly well in order to get to the end. Those upgrades will help, but don’t think that this is a game where you’re just grinding to be good enough in order to reach the end. But I do like that there’s a set objective to reach, it serves as a driving goal in this game where otherwise I might have just decided to quit. There’s that holy grail to reach for, something to accomplish, not just to get high scores. If you do reach the end of the cave, there’s an endless mode to go through, so don’t think that once you beat the game, that’s necessarily it. But in a world of games where there is no end, it’s nice to know that there’s a game that offers a finite point where you can say “I beat this game. I accomplished a finite goal." Now, Flop Rocket is certainly fun in its structure, but its challenging gameplay would fall short if it was too difficult to actually play. Thankfully, the controls miraculously make subtle adjustments to make it through the caves quite possible, thanks to the ingeniously-designed control wheel on the left side of the screen. Somehow, it makes both subtle adjustments for making it through a narrow path, and quick ones for bursting through a hole when necessary both quite possible. Seriously, the more I play it, the more I think that the scheme is just genius. Any other game using a turn-and-thrust control system needs to look at what this game has done and implement it for themselves. The more I play Flop Rocket, the more I find that this really is an ideal endless game. It’s enjoyable to have a solid goal to progress toward, which makes long stretches of game not feel boring. I like high scores, but they’re often more fun to get when others are getting them. Crossy Road (Free) was genius for including friends’ scores in the world so they were right there in your face, for example. What Flop Rocket does by giving you a set goal to work toward is to provide that same kind of motivation to keep going, but in a different way. I will tell developers not to copy the freemium model, because much as I like it personally, I am also invested in seeing developers actually make money. But this game does a great job at balancing out the two currencies, while still making those grinding runs pretty fun to play through. If it was a more standard free-to-play game, it’d still be wickedly fun, and other games could implement a lot of what this game does. But maybe some kind of motivation like this game does could become a key part of monetization in other games’ futures. But that’s talk for other games. What I’m saying is that for the average reader of the site, as someone who probably likes the idea of a one-time full-game unlock, you should check out Flop Rocket on principle but also because it’s a great game. 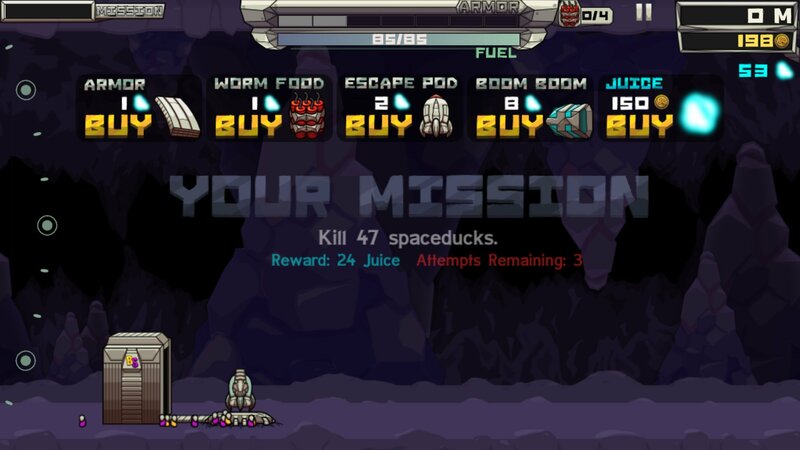 You can play it and know that you’re getting your money’s worth, and you get a lot of game out of this, because getting to space is extremely difficult, and a real accomplishment. Check this out.